Now I’m the wrong side of fifty, I notice that I’m getting more intolerant, although if you asked Mr D, he would probably say I’ve been an intolerant old bag for years. But let’s be honest, life seems to be getting more and more complicated in this 21 century where technology is supposed to be making things easier. Sadly I have a massive list of things that piss me off these days, but the one that’s really getting to me right now, is light bulbs. This morning I stood in front of a shelf in Sainsbury’s, trying to retrieve five dead light bulbs from my handbag without looking like a shoplifter, feeling completely and utterly useless as I tried to find new bulbs that vaguely resembled the ones I had in my hand. It used to be simple once, 40w for lamps, 60w for your average overhead and 100w if you didn’t care about unflattering harsh lighting or going blind. Most were bayonet, occasionally you had to buy a racy screw in. Now, quite frankly, it’s bloody ridiculous. How can there possibly be such a huge selection? Every lamp in our house seems to require a different bulb and I can’t even work out what wattage they’re supposed to be. Led, halogen, GLS, Eco, long life, C rating, E rating, A Rating Eco Stick, blah blah bloody blah. Even the box doesn’t give a clear picture so you have to take a massive risk and open the box hoping you’re not going to drop it on the floor, then measure one against the other while trying to juggle the dead ones, a handbag and a basket. And when you give up and in desperation ask an assistant, they don’t know either. Thankfully in our wee Highland toon, we are fortunate to have Pat Fraser’s TV and Electrical, a proper shop that has the answers to all things reliant on the national grid and if it hadn’t been a Sunday that’s where I would have been, handing over my dead bulbs and in an instant they would have been replaced and I would have headed home happy. Instead I headed home in a very bad mood with a random selection of bulbs, of which I now know two are wrong. Frankly I’m past caring, it’s easier to light a frigging candle. So whose fault is this? How did it start? How have we gone from three bulbs to what seems like a lightbulb free for all? Why do we need so many? Who is to blame? Europe? The French? Donald Trump? It must be Donald Trump. As part of our therapy into adjusting to being fifty something, Mr D and I have recently made a pact to use our remaining time on this increasingly chaotic planet constructively. I realise that we may actually have another fifty years to party but as some of our dear friends have already departed to another world, hopefully one more peaceful than this one, it’s better, I think, to hedge your bets. And it’s not been easy recently, my Scotrail Thrifty Club 50 card arrived and I became a Great Aunt. Now don’t get me wrong, I am delighted at the arrival of the gorgeous wee Gracie but the ‘Great’ bit, they can just forget. I am not yet ready to morph into Maggie Smith. The same way I am not yet prepared to ask for a free cup of coffee with my Club 50 card. Discount on my ticket? Yes. Asking for a sympathy coffee because I’m the wrong side of fifty? No. But I digress. As we are now down to only one fledgling in the nest and the washing basket no longer resembles The Magic Porridge Pot, (wash little mummy, wash, confused? Look it up) so it was that Mr D and I, amazingly found ourselves with a free Sunday and as the weather has been so uncharacteristically beautiful, we took off for a walk to a place I hadn’t been since the children were small, The Dunearn Burn walk in the Darnaway Forest, off the awful A96 between Nairn and Forres. A truly magical walk that takes you through beautiful deciduous woodland and if you are up for it, down the west side of the gorge to the mysterious River Findhorn. And magical it was that day. The sun was low in the sky which only served to intensify the rich metallic glow of the leaves and the absence of wind allowed the ancient song of the Findhorn river to reach our ears. A word of caution, however, it is not a walk for the feint hearted or those uneasy on their pins, as the path is at times steep and slippery, with unnerving drops down to the Findhorn below. What actually amazed me on revisiting, was how I never managed to lose any of my children as I regularly dragged three small Power Rangers along those paths for a bracing, healthy walk, as they maniacally tried to kill each other, me or themselves with stick swords and pine cone hand grenades. If I murmured to myself, “what was I thinking?” once as I looked over another vertical precipice, I murmured it several times over as we got closer to the river. For as you finally descend to the river itself, an enticing network of steep steps and ropes, guide you down to the pebbly beach below. How I ever got three small, excitable ninjas and a badly behaved Cairn Terrier down there on my own, I’ll never know but the madness of a tired mother, desperate to get out of the house and de-energise her children before bedtime, knows no bounds. But once again it was worth it, especially as waiting at the bottom of the steps this time, was a battered wicker chair, obviously used for fishing but which soothingly whispered, come, sit, rest a while and take in the view. And so we did. Mr D being the perfect gentleman and to be honest wanting to keep the peace, let his darling wife have the chair and served me a nice cup of tea. The fact that we had brought a flask with us unnerved me slightly, thankfully we hadn’t brought a tartan rug, but it was very welcome nevertheless and as we sat and took in a beauty which I cannot possibly describe, Mr D was inspired into poetic creativity, enthusiastically describing the River Findhorn as resembling Prince of DarkNess, a new smooth, deep black imperial stout, brewed by the Loch Ness Brewery in Drumnadrochit. The power of nature to inspire hey? Robert Burns would have been proud. Back at home I asked the fledgling whether he remembered the walks and how much fun it used to be? “Nope” was the usual teenage monosyballic, I can’t be bothered to think about your question, reply . I didn’t bother arguing. He’s too young to start reminiscing but hopefully when he’s older and finding himself far from home, he’ll remember our crazy walks down to the Findhorn and thank the universe that he actually managed to survive. If I’m honest, after two years studying A level English Literature in sixth form, very few quotes stick in my mind. I remember sobbing down the phone to my friend Mandy at the injustice dished out,(by men of course) to poor Tess D’urberville, and having King Leah’s ‘How sharper than a serpents tooth it is to have a thankless child’ quoted back at me by my dad, (pretty impressive for a copper from the East End of London) but Sir Walter Scott’s ‘Heart of Midlothian’ with its Scots dialect might as well have been Chinese to a 17 year old in a rural Cotswold comprehensive. If I’m right and I’m probably wrong, I vaguely remember that Jeannie walked from Edinburgh to London in bare feet. Sadly that’s all I remember, sorry Sir Walter, I’m sure if I read it now, having lived in Scotland for twenty three years, I might now have half a chance. Milton’s Paradise Lost was, at the time equally tedious. The only paradise being lost as far as I was concerned was in my precious teenage socialising time. But reassuringly there are a few quotes that I do remember. Shakespeare’s King Leah’s ‘Nothing comes of Nothing’ has been thrown out into the ether a few times when I’m on my parental high horse and Jane Austen’s ‘There are certainly not so many men of good fortune in the world as there are pretty women to derserve them.’ and ‘ A large income is the best recipe for happiness I ever heard of’ are also favorites. Shallow, I know, but it will always have a special place in mine and my pal Mandy’s heart. If I remember rightly, at the time I also had an unhealthy teenage crush on a portrait of Lord Byron, a bit weird, I know, having a crush on a poet who’d been dead for 150 years but that’s what unruly hormones can do to a woman. Encouragingly though for my ever hopeful English teacher, I was inspired by one quote, a quote that has stayed with me over the years, the first line of John Keats poem Ode to Autumn. And such has been the glory of this Autumn in the Highlands of Scotland, I’ve been inspired to revisit the poem and in honour ofJohn Keats re read the whole thing. For this Autumn has been mellow in every sense of the word as high pressure, sunshine and stillness, sadly absent from Scotland during the summer months, has settled upon us and soothed away the hurt of daily weather forecasts of grey, wind and 12 degrees. As a child of the rolling Cotswold countryside, I have always loved autumn, a time of harvests, mists, berries and dewy spider webs and if I’m honest I have never felt it to be quite the same living beside the sea in the North of Scotland. This Autumn, however, has proved me wrong and I cannot tell you how many times I have stood staring out of the window in complete awe of the beauty of our planet. The stillness and low sun has brought out an intensity of colour that is truly magnificent and day after day we’ve been royally treated to morning skies of pink and gentle mists rolling along the Moray Firth. The evening skies have also been spectacular; pinks and blues sometimes tinged with gold as the sun sets over the hills to the west. And as if Mother Nature has felt that she couldn’t repay us enough for the rubbish summer, she’s thrown in flocks of geese, flocks (or bevy) of low flying swans and jumping dolphins, all merely the warm up acts for her piece de resistance, beautiful starry skies and The Northern Lights. Glorious. So glorious has it been that I set out for a walk early this morning before the light frost disappeared and as I walked down the road toward the beach, a deer stepped out in front of me, calmly stopped, looked me in the eye and then gracefully disappeared into the bushes. Even the deer was mellow. The beach was deliciously empty apart from the sea birds and instead of walking at my usual pace I decided to follow the lead of the deer and be mellow too. Interestingly, at this point, my phone decided that it too wanted to be mellow and shut itself down for no apparent reason. As a consequence, I was treated to a feast of beauty that I would not usually appreciate. Have you ever looked at a lobster trap close up as it really is a work of art? Even the seagulls, the bane of our wee Highland toon were majestic as they rose in a silvery flock against the intensity of the blue sky. Dian translated from the French means divine, and even if you have no faith, this autumnal feast of Dian beauty has inspired many. The Nairn Facebook Page Nairn Rocks has been brimming with photos of sunsets, sunrises, Northern Lights and blue seas, the love it or loathe it modern way of sharing good things with each other and more importantly appreciating what we have on our doorstep. 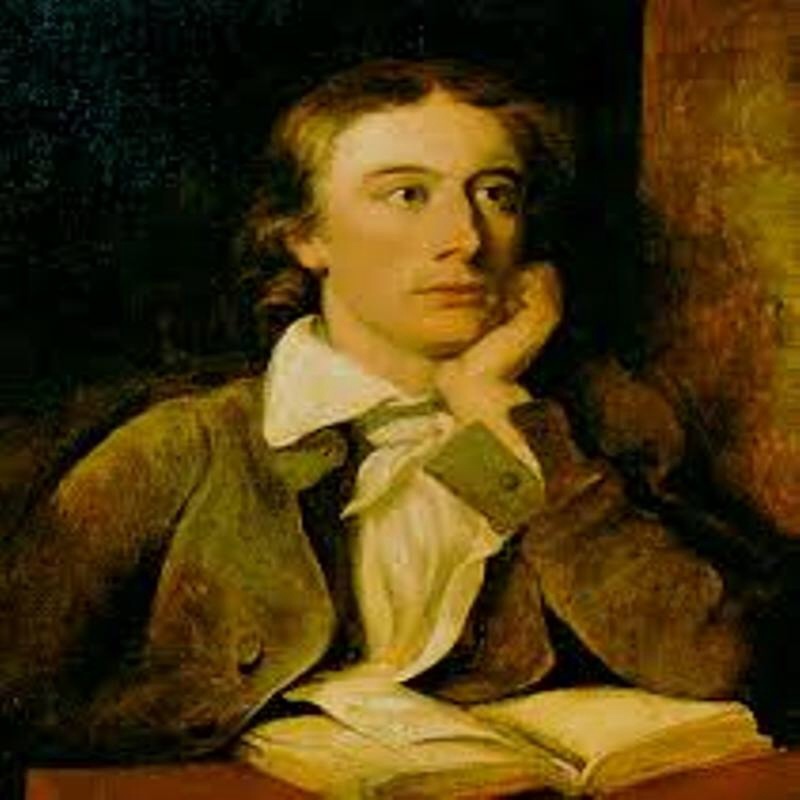 If John Keats were here now, I’m sure he could have put it all into words. Sadly I am unable to match his poetic prowess. I would like to think, however, that he’s currently looking down and smiling, content in the knowledge that a wee girl of average intelligence in a small town comprehensive, was inspired enough by the beauty of his work to remember a line from one of his poems and finally learn to appreciate him thirty years on.